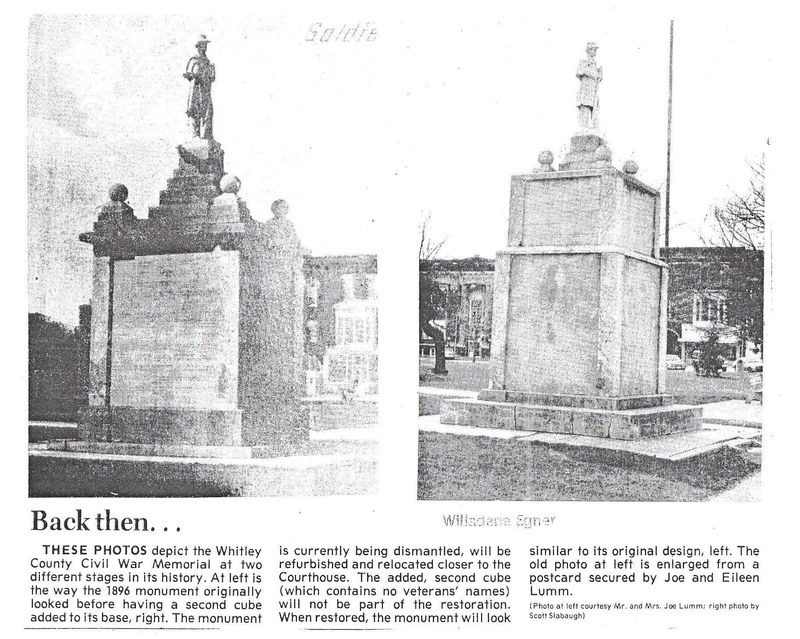 Additional Description: From the Whitley County Historical Society, this news clipping documents the changes to this Memorial over the years. The first change came in the early 1900's by adding the second section to assist in adding more names. Next change occured due to foundation troubles discovered in 1985. At which time the Memorial was dis-assembled and moved to the front Entrance of the Court House on top a heavy duty stronger foundation. The majority of the parts of this 1896 G.A.R. Civil War Memorial were used in the 1985 rebuilding. The "Infantryman" Statue received a 'loving care' cleaning and replacement at "Parade Rest !"